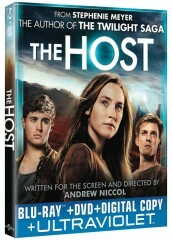 I was recently given the opportunity to check out the DVD for Stephenie Meyer’s latest book turned movie, The Host. I was pleasantly surprised by all of the amazing feature on the DVD. It included Blu-Ray, DVD, Digital Copy, and Ultraviolet. All of that to say, I can watch it anytime or anywhere! Seeing as I’m a big fan of the book, I was so excited about the movie coming out. When I first saw the film, I was thrilled with the cast’s performance. The only difficulty I had was the accelerated timeline. I felt it hurt the connections between characters that should have felt more natural. The DVD is the same film, but I was looking forward to the deleted scenes most. I would loved to have seen more from the deleted scenes, but loved the commentary that really revealed more from behind the scenes. I think it’s great that Stephenie has been involved in the making of the film, and appreciate her being so open with the readers/watchers on the DVD during the commentary. If you’re a fan of The Host (the book) I think you’ll love watching your favorite characters come to life in the movie. Saoirse Ronan, Jake Abel, and William Hurt really brought the story to life for me. Without being too spoiler-iffic, I also loved the backstory we got for Seeker in the film. Go order your copy of the DVD on Amazon!